HUNTSVILLE, ON – They’re the kind of obstacles most drivers try to avoid. But big rocks, deep ruts and steep inclines are targets when you’re behind the wheel of a rock buggy. What’s a rock buggy, you ask? Think of it as a dune buggy on steroids. Or what you might get if you crossed an all-terrain vehicle with a monster truck – and a chip wagon. 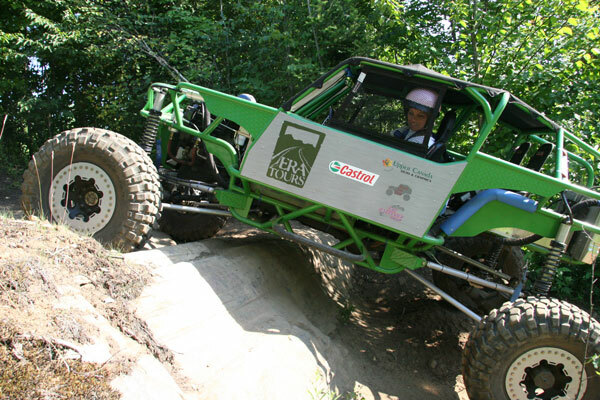 One of ERA Tours’ four rock buggies prowls the trails near Huntsville, Ontario. “The fuel these machines run on is 100% canola oil that the kitchens at Deerhurst (Resort) have used to cook their fries and fish and stuff in,” explained Eric Frankcom, who custom-built the buggies with his brother Regan. And gentlemen, if you think these extreme off-road vehicles are just for you – think again. I tried to keep her enthusiasm in mind as I eyed up the two-tonne green monster I soon would be driving. Four rock buggies growl through the wooded trails at Deerhurst Resort as part of a new venture by ERA Tours. The Frankcom brothers designed the machines to tackle the rocky landscape of the Canadian Shield. Good to hear, considering my off-roading experience is pretty much limited to mountain biking. But after a 15-minute safety briefing and driving instructions, I donned a pink helmet (don’t worry guys, yours are black) and felt confident I could handle this new off-road adventure. 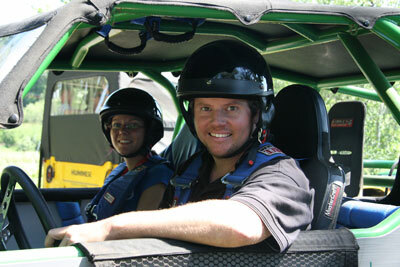 Eric Frankcom prepares to lead a rock buggy tour. The Frankcoms hit on the idea of “you-drive” rock buggy tours after Eric drove a rock crawler in California eight years ago. Rock crawling is a form of slow-speed, precision driving where highly-modified 4x4s such as pickup trucks, Jeeps and buggies climb rock piles and craggy hillsides. The brothers decided rock buggies would be the perfect complement to the Hummer tours they’ve been running at Deerhurst since 2004. But at $60-80,000, existing rock crawlers were way beyond their budget. So the Frankcoms set out to build their own. As I gripped the steel tubing frame over the door, put my legs through the window and slid into the driver’s seat Dukes of Hazzard-style, I couldn’t help but marvel at the brothers’ ingenuity. How did they know where to start? “We went on the internet and said ‘what do we like?’” Regan recalled of their initial research. Then it was a matter of sketching out the vehicle and sourcing parts, many of which came from wreckers. As a welder and mechanic, 30-year-old Eric had the know-how to build the vehicle from scratch. And their father’s machine shop in Midhurst provided the perfect place, and the equipment, to do the work. Six months and about $30,000 in parts later, the Frankcoms had their prototype: a 1¾-inch DOM frame and chassis with articulated axles, powered by a refurbished 12-valve Cummins 59 diesel engine. That engine growled to life as I pushed the starter button and pumped the accelerator. Within seconds, the sweet smell of French fries filled the air. With their biodiesel and recycled parts, the rock buggies are as eco-friendly as off-roading gets. But make no mistake – with 165 hp and 350 foot pounds of torque, their engines are full of power. After fastening my five-point safety harness and securing the mesh netting over my window, I was ready to put this mean machine to the test. I pushed the T-handle shifter into drive, pressed the accelerator and the rock buggy started rolling down the trail. So far, so good. Mind you, the first part of the trail is basic so drivers can get a feel for the buggies. The hydraulic steering was a breeze – in fact, I was oversteering at first. The manual brakes were another story. I found I really had to stand on them going downhill. It also took a while to get used to the wheels being on the outside of the frame as opposed to underneath. Calm? Yeah, right. My adrenaline was pumping as I nudged the accelerator and the 37-inch tires began to grip the rock. The vehicle canted upward and my view out the windshield was nothing but blue sky and treetops. But sure enough, the wheels held and the buggy crawled to the top. Over the next 90 minutes, we tackled steep drops, rock outcroppings and tight curves. Not once did I feel like I was going to roll over, thanks in large part to the two 14-inch coil-overs by every wheel. “That’s what allows these vehicles to do what they do,” noted Regan. As I guided the rock buggy to a stop and flipped down the toggle switch to shut off the engine, I felt exhilarated. But don’t take my word for it. “I’ve ridden ATVs and all that, but this is incredible!” said Shane Davenport, 23, of Pickering. “That was intense,” agreed another driver. The rock buggy tours run from the May long weekend until Thanksgiving, depending on the weather. Drivers must be at least 21 and licensed. A 90-minute tour costs $169 for drivers and $20 per passenger (maximum of three). As for the Frankcoms, they plan to build two more rock buggies over the winter to help keep up with the increasing demand. Yep. Now bring on those boulders. Cindy Burgess is a Toronto-based freelance journalist.